Sweet chord progressions, authentic synth hooks played on classic analog equipment, this collection focuses on the late 70's and early 80's and covers Soul and Nu Disco styles. bass, funky clav's, piano, rhodes, analog synths including Moog and ARP, strings and more! 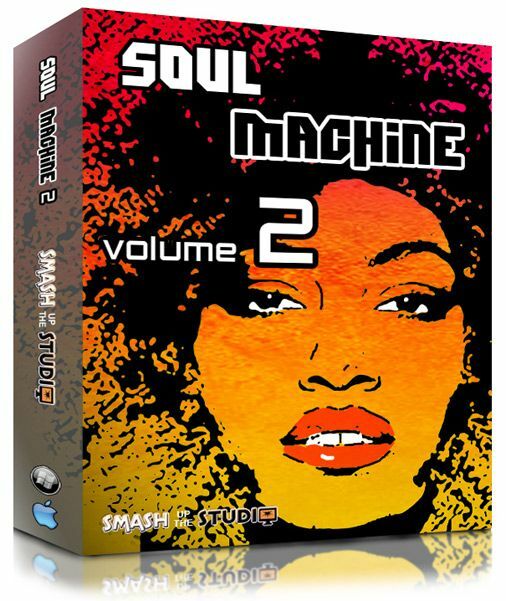 By popular demand Smash Up The Studio is pleased to present "Soul Machine 2" the long awaited sequel to their best selling sample and Midi pack "Soul Machine"
Each of the 7 construction kits are featured in the demo and all the loops are available separately so the user can build and arrange each track to their own personal requirements. As well as Wav and Apple Loop formats we have also included Midi wherever possible to add more flexibility. Everything you hear in the demo is included in the pack apart from the drums. Also the organ in kit 1 is Midi only. In addition to the 7 construction kits there are also 80 independent loops ranging between 4 and 8 bars in length. These loops have all been professionally performed and recorded in 24 Bit audio. Performed and produced by Steve Burton exclusively for Smash Up The Studio.